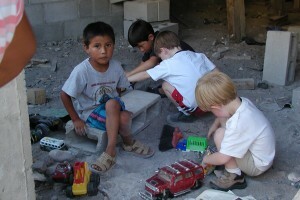 When Ezra was two and Zach was three, we went to a squatter’s village in Mexico and, working with the people living there, we cleaned the school each morning for a week. While the poverty of the village – the living conditions, the prospects of its residents, all of those awful malnourished dogs running everywhere – weighed heavily on me, my kids felt no such burden. They couldn’t believe how awesome the place was. There were crazy dogs running wild, kids running barefoot and playing for hours in dirt. And then there were all of those super cool houses made from old tires and corrugated steel. I was disheartened that the boys didn’t seem to notice the difference between home and this village whose school had no electricity, no running water, and virtually no classroom supplies. They thought everything in Las Palmas was just swell. “Why are you here?” asked Kathryn, the woman leading our trip, when I explained to her my dismay over the boys’ attitudes. I realized that I had no idea why we were there. To help? That was ridiculous. We would have been more help if we stayed at home and donated the money we spent on the trip to an organization that provides small loans to people. To teach my kids about poverty? That seemed creepy, and it clearly wouldn’t have worked anyway. Why were we there? We returned twice more to be with our friends in that village in Mexico. Then in 2010, we went to China for a monthlong mission project with an underground church there. Last year, we came to Costa Rica for a two-week vacation. And we are currently in Costa Rica for three-months as part of Jeff’s sabbatical. As clueless as I was during that first trip, I actually know a thing or two now about traveling with children overseas and for extended periods of time. This series of posts does not contain helpful, practical tips. For that, there are better resources. Call your doctor about vaccines; check out the State Department website for important travel information; make sure you’ve packed everything by consulting a universal packing list; and type the following into Google: What do I need to know about traveling to _____? Stay somewhere with a pool. Maintain both a home base and at least a few of your rituals from home. Remember that your kids will be just as wonderful and rotten as they are at home. So will you. Your kids won’t give a hoot about your purpose. Do less. Of everything. Except sleep. Make friends with a local. Check back in Monday through Friday for the next two weeks to read more about each tip. And be sure to share some of what you’ve learned in your travels as well. In the meantime, Pura Vida!